So I started this little thing (OK it will not be little by the time I’m done) last night while watching the beiginning of the Olympics. The Japanese Man’s Short program for the team event – goodness that boy made it look easy! Blew them all off the ice. So here’s what I’ve got so far. 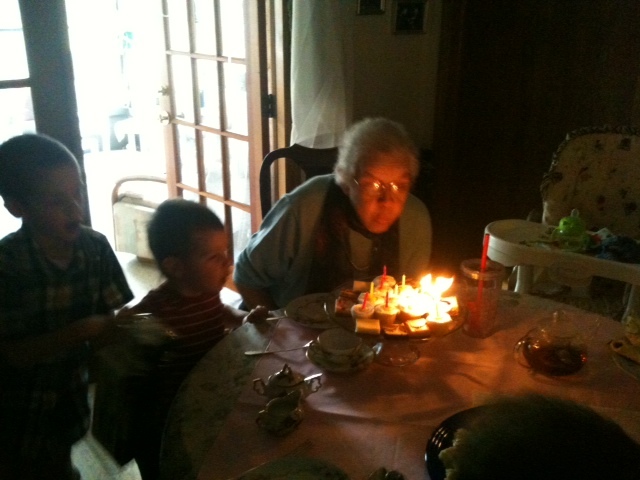 Grandma’s birthday has just recently passed, and we had a lovely tea party. I was asked to do the cake. Well, cakes. It was expressly requested, I make Petite Fours. Well. I thought I would make a sheetcake, cut it up, cover it in thinned royal icing and be done! Not so much. The cake crummbled a bit, no real surprise, the icing was a bit heavy and knocked some of the cakes over, did not cover well (too thick to settle on the sides) and never hardened the way I intended. This part just MIGHT be as I am in Florida and it was a very humid day when I tried this. Let no one tell you location does not matter. We live in soup air sometimes down here. The trade off – no snow. All in all, the day was lovely, tea was drank, lots of it! Cake was delisious, if a bit sticky, and the company (sisters, Mom, one of my BIL and the nephews) was great. Maybe next year I’ll try fondant…. Anyone else planning to knit through the Olympics? 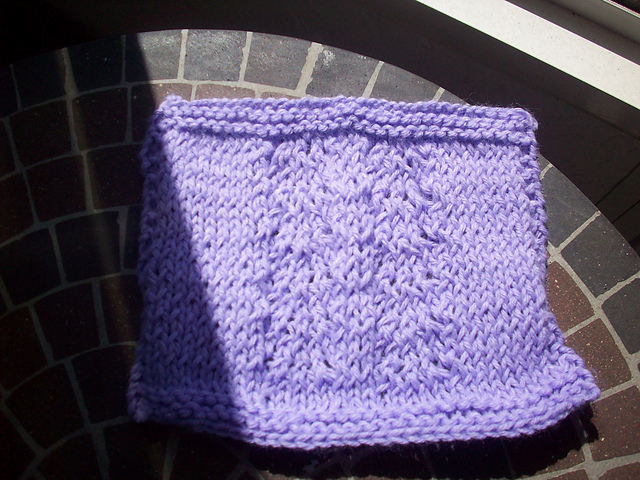 My darling asked for something to warm his hands as it has been a bit chilly here recently. I showed him a number of pattern pix, asked what he wanted (this includes a logo on the back of the hand – to be done as dupilicate stitch I think) and got the OK on a pair of Peekaboo mitts – except now he wants fingers. On one of them. Um… OK….. 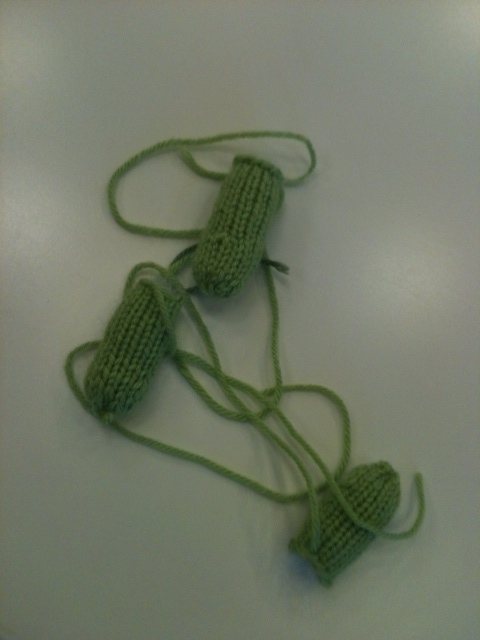 So one down, one getting fingers – fiddly little bits that they are….. 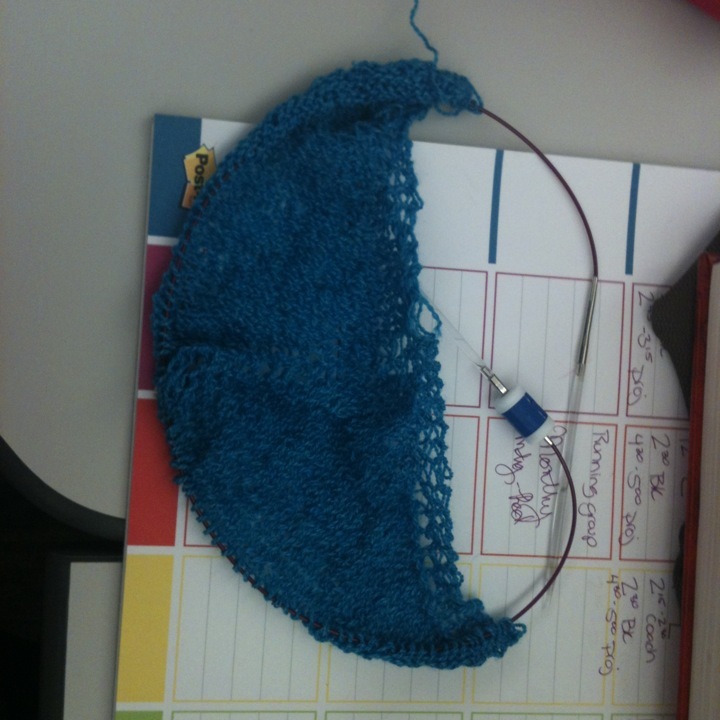 Here I sit, catching up on podcasts, wearing 3 knit items (only one by me, thanks Dee! and swap partner from winter of 2010!) as it is cold in Florida today. 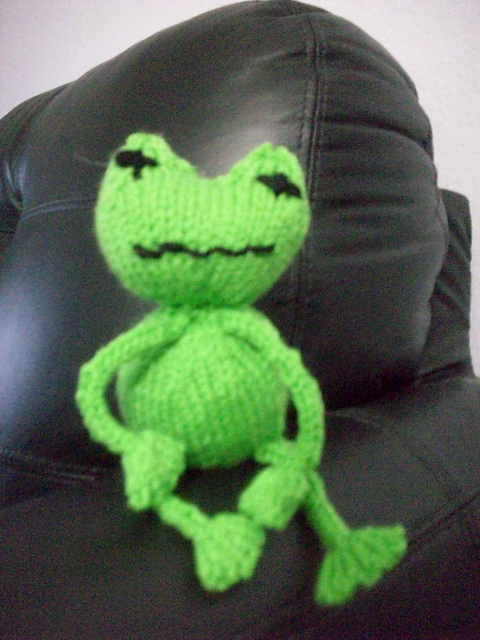 I have recently finished a number of smaller items (see my Rav page for the latest) and am finishing up one more WIP today. I have decided 2014 is going to be Stash busting year – and have chosen to work through at least 20 skeins – I have lots of stash, much of which was donated and I need to decide what to do with… I know I have a bag of tangled mess that I am debating untangling…. Or perhaps it is not worth it… This remains to be seen. I hope to have better access and to be able to post pictures soon, which will allow me to keep you better updated! Toodles! Here is the current progress. 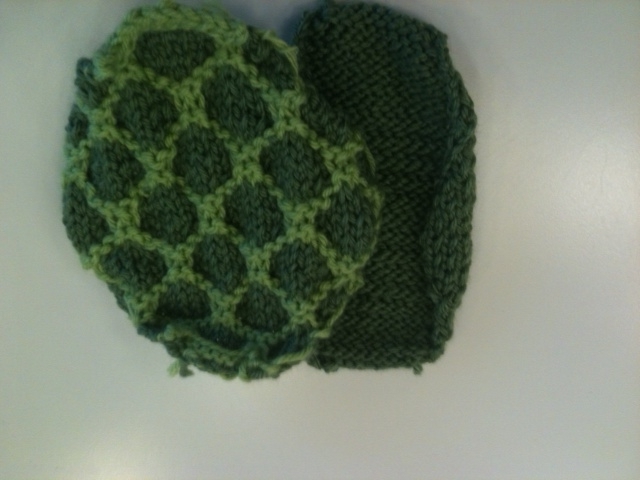 Here are the start of the mitts I mentioned last post. They are made with Serenity Sock in Surf. 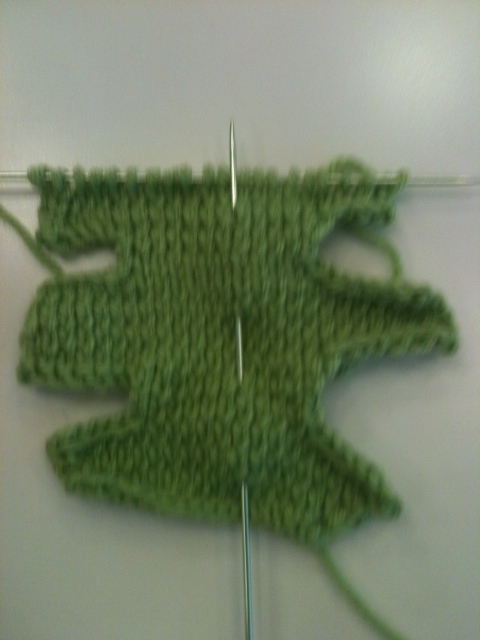 The pattern I am using is Hand Charmer. The button holes are repeated in such a way that it forms a lace-ish design along one edge . You can flip the holey area toward your fingers or toward your wrist. Both ways are cute. I am participating in Nerd Wars again. I am planning myself out a bit better then last time, so I am contributing more. So far I have completed 3 items. 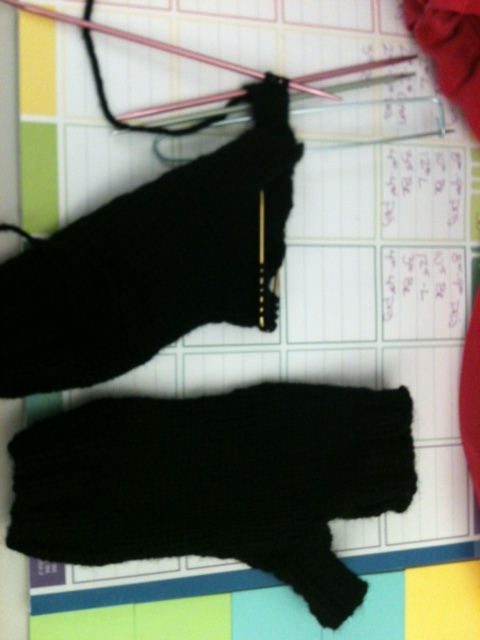 Now I am working on a pair of fingerless mits. 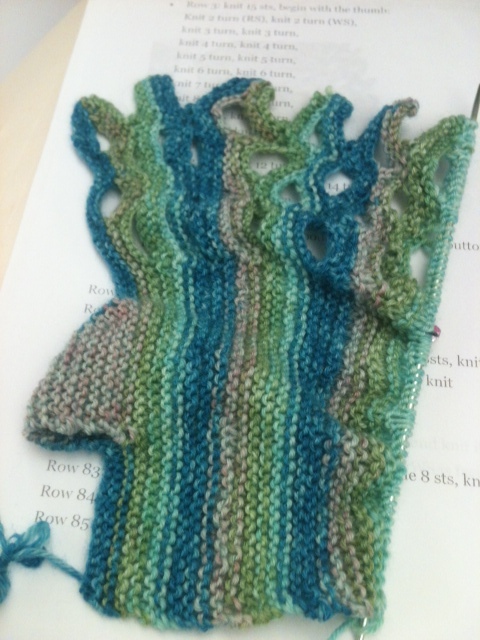 I am calling them Seaweed mitts, the color and the pattern kinda scream “sea” to me. Anyone else participating? What team are you on? 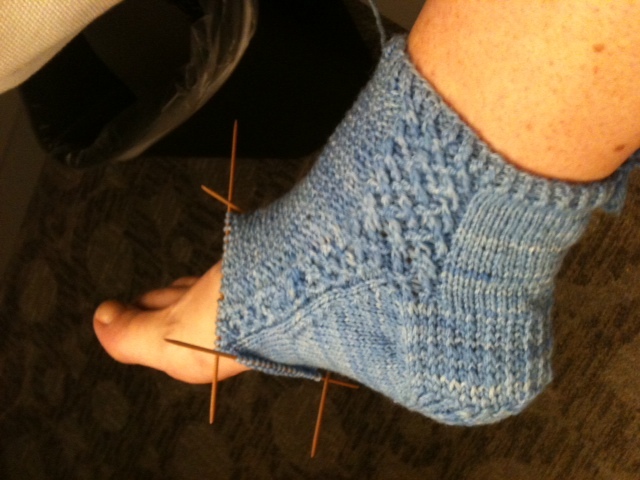 OK, so I am still working on the sock. Yes, the first of the pair. Hush! I have turned the heel, and am starting the foot decrease design (for any of us that have also seen or knit this pattern). Soon I should have a sock! 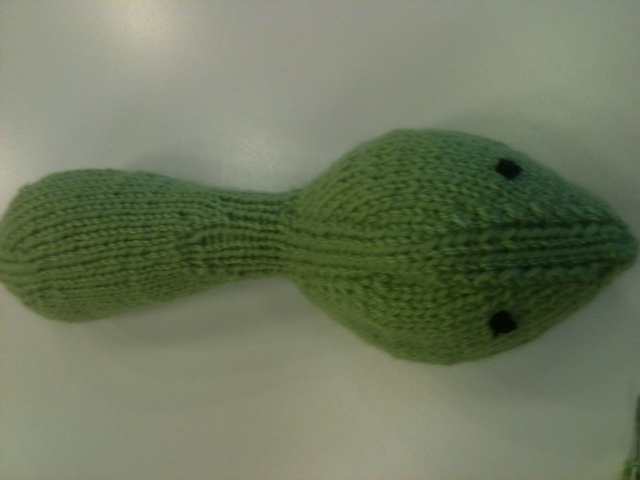 And need to knit the other one!